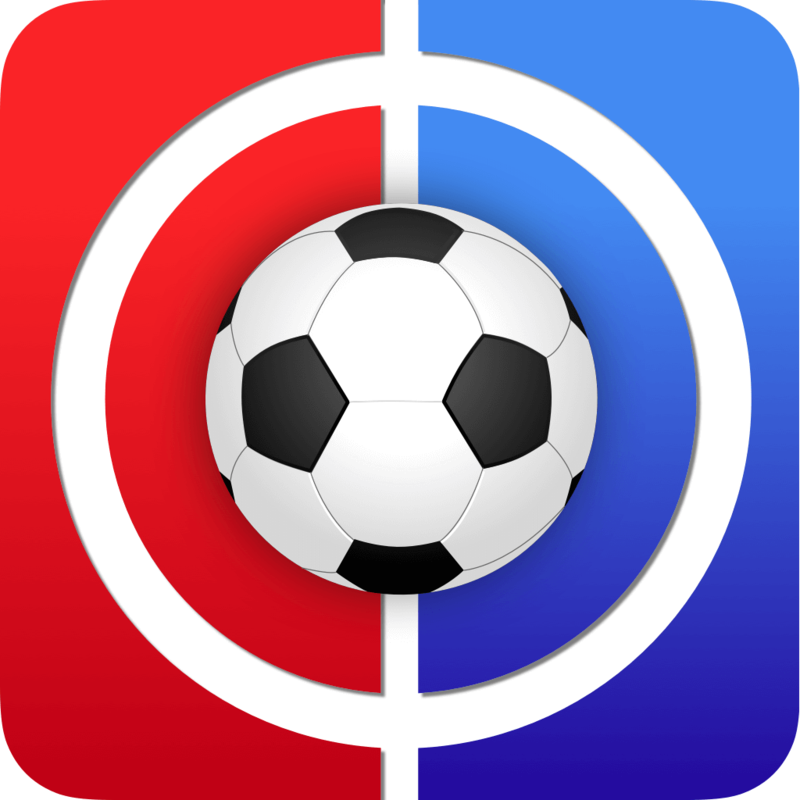 Welcome to Fantasy Football Fixture Analysis Gameweek 2. And as quickly as that, it is all over. All the optimism pumped into you on these boards over the past few weeks has been shattered, all that boasting to your mates that they may as well just pay you the league winner’s money before the season starts has backfired, and all that time picking hidden ‘gems’ was wasted. Indeed, the only hidden gem we truly managed to find – Aaron Wan-Bissaka – was parked on our benches, sandwiched between reckless Enabler A and feckless Enabler B. I joke, of course. We are one week in. I will save you the patronising hare and tortoise, sprint and marathon rubbish in the hope that someone wildcards for the entertainment of the rest of the site. Forget Gameweek 1; we have a week to pump up the optimism once more, to boast to our mates again, and to find another hidden gem or two. Luckily, I am not on Tips this week so I will just rattle off the teams that have nice, pretty green fixtures and save the hard work for a better man. Sit tight and don’t do anything knee-jerk. If you watched the games, the ‘eye test’ might justify a transfer, but following the crowds of people who get bored after six gameweeks when they have not won a copy of FIFA 19, a match ball, a rucksack and a mug yet is stupid. Furthermore, the prediction websites often get price change calculations wrong at this time of the year so do not let the ostensible hive of activity on those sites trouble you. No surprises here. Just like the site team’s justification for Mo Salah, Manchester City is Manchester City. They breezed past Arsenal 2-0 in their own backyard with even more quality left sitting on the bench. Not only that, but their next six fixtures are as good as you could ask for (I deliberately refrained from saying ‘as good as money can buy’) – the six promoted sides over the past two seasons, four of which will be played in front of a home crowd at the Etihad. Picking players immune to Pepotation – and, yes, that is the best portmanteau I could come up with – might be nigh on impossible, but going without their players over the coming weeks is surely playing with fire. During their 3-0 defeat at home to Chelsea, Huddersfield look much the same as they did last year; rubbish. Wagner’s men conceded 33 away from home, placing them 16th in that regard overall and, having failed to strengthen at the back over the summer (except making permanent signings out of two of their best, Terence Kongolo and Jonas Lössl), I doubt they will be able to put up much of a fight against a free-flowing City team who averaged a staggering 3.21 goals per home game last season. Manchester City then come up against newcomer golden boys Wolves who looked a bit fazed by all the unwanted pressure that has been put on them against Everton on Saturday. City averaged 2.37 goals per away game last season, and Wolves did not offer enough against Everton to instill me with much confidence of a solid defensive showing against the Citizens. To round it off Newcastle make their way to the Etihad the following gameweek. Unfortunately for Newcastle fans, House of Fraser is not a shiny new £90m striker but just another business for their owner to add to his mountain of things he cares about more than the football club itself. They conceded a poor 30 goals away from home last season and I doubt they will cause City many problems. Did I mention that they then face Fulham (H), Cardiff (A), and Brighton (H)? One thing you can do to help you stave off using your Wildcard early doors is to triple up on last season’s champions. 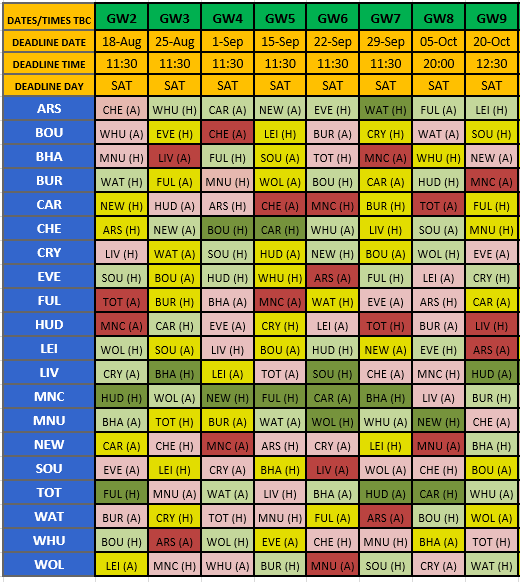 It probably won’t be enough in itself to stop you, but at least you won’t have had a total car crash before getting twitchy fingers on the Saturday of Gameweek 4. As for City defenders – not that Mendy is even a defender – which may prove to be a more concrete way of getting regular starters from City into your side, they only conceded 27 goals in total in the last campaign and neither Huddersfield (0.63) nor Newcastle (0.95) managed to average even one goal per game away from home. Defensively, Everton looked shaky against Wolves (perhaps understandably after Phil Jagielka’s first-half red card), although the late arrivals of Yerry Mina, Kurt Zouma and Lucas Digne should provide some degree of solidity. They conceded a steady if not impressive 22 at home last season, although Southampton’s measly 17 away goals last year coupled with Huddersfield’s 12 provides strong conditions for returns from Everton defenders. Bournemouth scored 26 at home last year, and will probably beat that tally this year if they start playing Josh King up front and giving him penalty duties (no points for guessing who forked out an extra £0.5m for Callum Wilson’s strike partner). Everton conceded a pretty terrible 36 away last season, which was only ‘bettered’ by West Ham, Leicester, and Stoke, so do not expect a clean sheet there, unless their acquisitions have a bigger (and quicker!) impact than expected. Offensively, a brace from Richarlison was enough for Everton fans to decide that £40m was a bargain, which they proceeded to let every Liverpool fan on Twitter know about. They scored with relative ease at home last season (28) and the addition of Richarlison will likely see that total passed this time around. At the time of writing the severity of the Brazilian’s injury is unknown, although he seemed to be walking on it okay after the match and Marco Silva did not seem to make anything of it in his post-match interview. Bournemouth had one of the worst home defensive records last season, conceding 30. Two away games in their next three might make Liverpool seem a strange choice, but last season Crystal Palace conceded 27 at home, Leicester disappointingly let 22 past them, and Liverpool’s 39 goals away from home was second only to you know whom. Liverpool’s average of 2.37 goals per game at home last season should see them record a comfortable result against Brighton in Gameweek 3 despite strengthening in left and right-back through Bernardo and Martin Montoya, respectively. Arsenal and Chelsea would both have been included if it were not for playing each other this coming weekend. They both have a very favourable string of fixtures after their London derby, but like a terrible cliff-hanger in a soap opera, I will leave that for next week’s writer to enthuse you with. Newcastle’s next fixture against Cardiff seems relatively kind, although their away form has already been addressed above such that I would not be surprised to see the lads return from Wales disappointed. They then face a Chelsea side invigorated by trying to play ‘Sarri-ball’. I must admit, I did not really know what ‘Sarri-ball’ was. I watched the game, I still did not know what Sarri-ball was, although apparently they have not learned how to play it yet. I tried to find out what Sarri-ball is; ‘high intensity, passing football’, apparently. Ahh, right, sounds revolutionary that. Whilst I do not think Sarri-ball is some newfangled style of football that will make Chelsea unplayable, I do think that Chelsea’s statistics from last season needs taking with a pinch of salt. Heck, maybe even as much salt as a portion of McDonald’s chips. Conte lost the dressing room before he had even managed to find it! They managed to keep hold of Hazard, which spells trouble for their opponents, although they failed to bring in a striker and have seemingly failed to inject their current striker with any confidence. At any rate, they still averaged 1.68 goals per away game and conceded just over one per game. I think it probably does suffice to say that Manchester City is Manchester City here, away from home of all places. The next two will not be easy for Chris Hughton’s men as they welcome Manchester United to the Amex before their most dedicated fans make their way up to Liverpool, unfortunately to play the ones that wear red, not blue. Liverpool has already been dealt with above, but Manchester United managed to concede just one goal per game on average away from home, so don’t expect your Brighton assets to be raking in attacking points, especially now that Mourinho has Toby Alderweireld Harry Maguire Diego Godin maybe, potentially, hopefully realised that the pairing of Jones and Smalling is not the answer. The visit of Fulham seems a long way away with these two fixtures before it, and even then Fulham appears to have a stronger side on paper than Brighton after a strong transfer window. 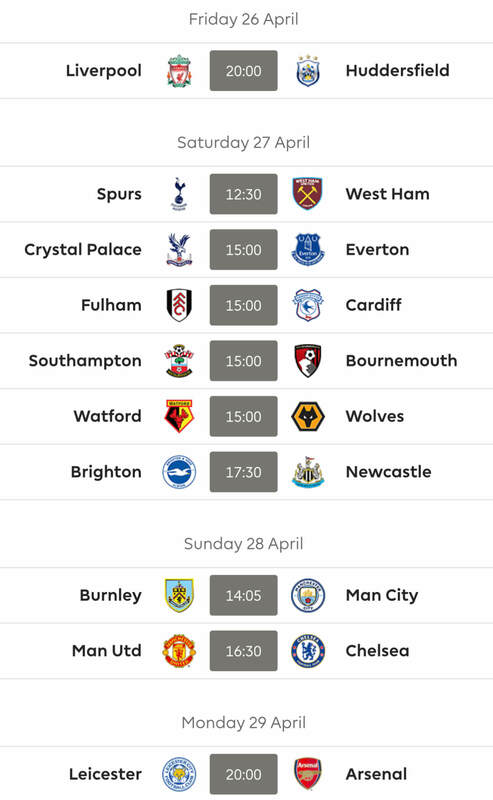 Fixtures for GW2 and beyond is live. No rest for you wicked lot!! Big thanks to AT for a classy look at who to consider and who to ignore. Great stuff AT, your work, especially at the weekend is greatly appreciated mate. hey AT, thanks for the write-up and all the valuable thoughts. btw, cracking score in the 1st GW you had! Guys, isn’t there a regular league or something? I figured i’d be in but I’m not. I feel my team is pretty set apart from the United coverage that needs to go in Sanchez. Sanchez to Mane a decent move? I’d be tempted to keep Sanchez for another game. It’s hard to take United seriously under Mourinho. Even with the worldclass players he bought. Well, sounds like you took them seriously enough to include Sanchez in your side. Their fixtures are tricky, but not terrible. I was hoping for class from him but United are sort of clueless, to be honest. Emailed you the code Raz. I shall not panic I shall not panic I shall not panic and take a hit! That’s my mantra for the week! Many thanks for your swift work on this AT and your insight , sorry, stating of the bleeding obvious But hey, sometimes that’s just / all what’s needed. Especially with so many banging on about 5.0 players, you often get what you pay for in the long term and I do try to concentrate any actual transfers on the more generally bigger hitters myself. Because, you know, there’s a reason they’re considered bigger hitters. Well done mate and thank you. That’s the way to kick the week off! Plenty of stats, stats, stats. Lovely! Nice article bud. Enjoyed that.